The land will be befouled and God’s creatures will be senselessly slaughtered. This is not England during the Industrial Revolution or America amid the Reagan Revolution. It is China in full throes of the Cultural Revolution. 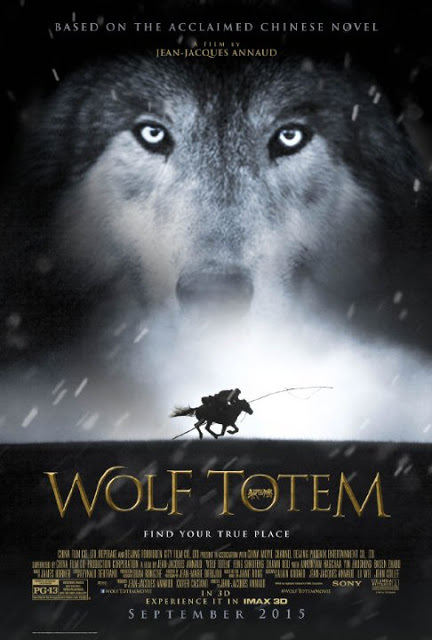 As they witness the consequences first-hand, two formerly eager volunteers will be deeply disillusioned by the Party’s ruinous policies in Jean-Jacques Annaud’s Wolf Totem (trailer here), which opens this Friday in New York. When they first arrive, cadres Chen Zhen and Yang Ke really believe they will be making a difference for the hardscrabble herders of Inner Mongolia. However, they quickly learn to respect the power of nature, especially the danger and beauty of the regions’ wolves. They also cannot miss the bad vibes radiating off the local party boss, Bao Shunghi. However, they manage to settle in with their ethnic Mongolian hosts rather nicely, especially considering the condescending nature of their assignment. Frankly, they learn more from the herders than vice versa. After a too-close-for-comfort encounter with a wolf pack, Chen Zhen becomes increasingly fascinated with the Eurasian Wolves. He cannot shake the idea they deliberately spared him. Therefore, he is increasingly appalled by Bao’s cruel bounties on wolves, to pave the way for the locust-like settlers. He is also threatening the nomadic herders’ traditional way of life by despoiling their grassland for his developments. Seeing the wolves’ numbers dwindling, Chen Zhen does something rash. He secretly adopts an orphaned wolf cub. Yet, it is immediately clear the young wolf will always be too wild to live among people, but might become too domesticated to survive in nature. Do not take this as a joke: it is frankly amazing what expressive performers these wolves are on the big screen. Lead training Andrew Simpson raised 35 region-appropriate wolves especially for the film—and the camera absolutely loved them. Even with extensive safety measures in place, Feng Shaofeng did not escape injury working closely with the wolves, but it was probably worth it. The co-star of White Vengeance and The Golden Era gives probably his career best performance as Chen Zhen. Once again, Shawn Dou is stuck playing second banana, but he keenly expresses the bitter nature of their hard lessons learned. Yin Zhusheng also makes a perfectly odious yet charismatic villain as Bao. Regardless, nobody will ever upstage those wolves. It is a not-so minor miracle this adaptation of Lu Liamin’s autobiographical novel (written as Jiang Rong) was ever made, especially considering Annaud was banned from China for years following Seven Years in Tibet. The explicit environmental themes and only slightly more muted critiques of the Cultural Revolution are also third-rail kind of subjects for the state film authorities. Nevertheless, they not only lifted Annaud’s ban and helped underwrite the production, they also chose Totem as China’s official foreign language Academy Award submission. Clearly, they are playing to win rather than score PR points with a non-existent international audience, as they often have in the past. Big and sprawling, with a green conscience, Totem is an Academy-friendly film, in nearly every way. It also happens to be a very good film, which is a nice bonus for the rest of us. Totem offers more striking proof of why Annaud is considered the best contemporary narrative filmmaker working with animal and natural subjects. Cinematographer Jean-Marie Dreujou captures all the wolves’ twitchy power as well as the stunning beauty of the surrounding vistas. The late great James Horner’s reputation will also be further burnished by what is sadly one of his final scores. Few composers could produce such sweeping themes that are still so distinctive and evocative of a film’s time and place. It is an aesthetic marvel and one of the best environmental films in decades, precisely because it makes deeply compelling spiritual and cultural connections to the threatened Mongolian ecosystem. Very highly recommended, Wolf Totem opens this Friday (9/11) in New York, at the AMC Empire.